So tonight I was painting Precocious Daughter's room. 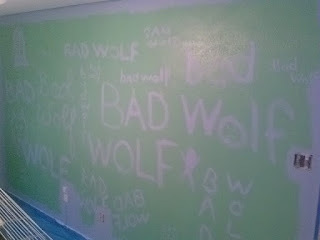 And yes, this is the same room I started painting a week and a half ago. No, it shouldn't take this long to paint four walls, except that every night since I started I've been too (pick at least two) tired/ busy/lazy/angry/ sad/drunk to paint. Don't judge. Or, you know, judge if you want. It won't get the damn walls painted any quicker. Anyway, tonight I got back to it. Unlike last time, I was painting solo; PDaughter is having game night with her nerdfriends tonight. So I've got some music playing, everything is taped and drop-clothed, and I'm a-painting. Then I got bored. And this happened. As of this writing, she hasn't seen it yet. 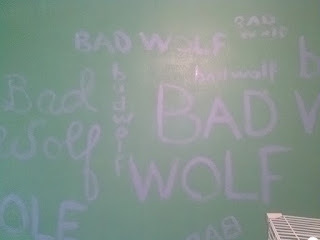 I think she'll appreciate the Doctor Who homage, don't you? And in all fairness, there is a good bit of paint on the wall, so I don't think I shirked my duty. Who wouldn't want this awesome wall in her room? 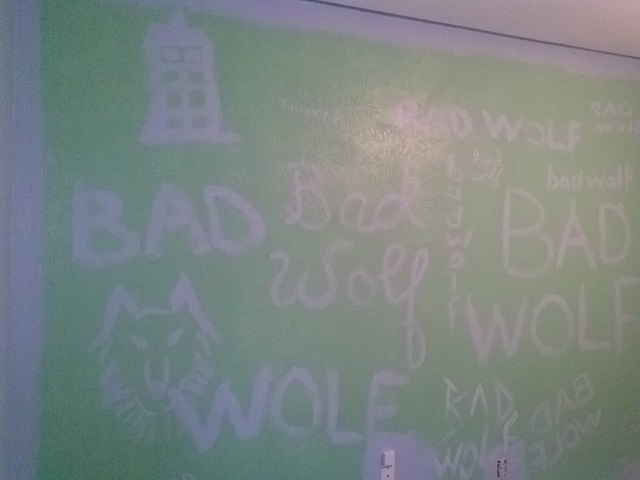 She's going to make me paint over it, isn't she?